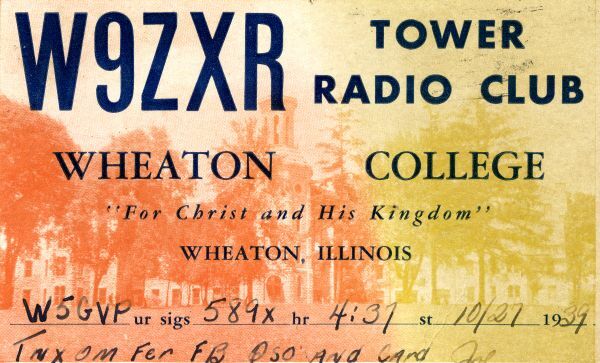 As the Wheaton College community bids farewell to WETN, perhaps this is an appropriate moment to commemorate W9ZXR, the “other” ham radio station. Since its inception in 1937 until about 1980, ham radio station W9ZXR was located in the base of the Tower of Blanchard Hall. Students were responsible for scheduling and programming, learning many of the skills of broadcasting. However, as various media expanded, interest in ham radio gradually diminished, and many of those involved with its operation simply shifted their activities to WETN, then located in the basement of the newly-constructed Billy Graham Center. In the late 1970s, Col. Warren Schilling, assistant director of the Physical Plant, was tasked with locating and shutting down campus energy drains. Consequently electrician Gary Beeman was sent up the Tower to investigate. Entering the rooms at the base of the Tower, he was amazed to discover that the studio, dusty and forlorn, had been abandoned for some time, perhaps years. Even more amazing, he discovered that the transceivers and generator were still fully operational and, in fact, currently activated, humming quietly to silent airwaves. Indeed, he had discovered an enormous energy drain. According to Beeman, it was as though the last announcer simply stood up from the console and walked away, locking the door behind without a thought of returning. Beeman shut down the controls, snipped the necessary wiring and began the process of dismantling the equipment. Off campus, the tradition continues locally with the Wheaton Community Radio Amateurs, who meet to promote the advancement of the hobby and science of amateur radio.